Look, you're an adult. And being an adult means knowing both what you want and getting what you want. In this case, that means knowing you want this product and doing your damnedest to get it. What is this product? Well, it's a Hunger Harness -- or as The Takeout describes it, a "feed bag." You know, like for a barn animal. 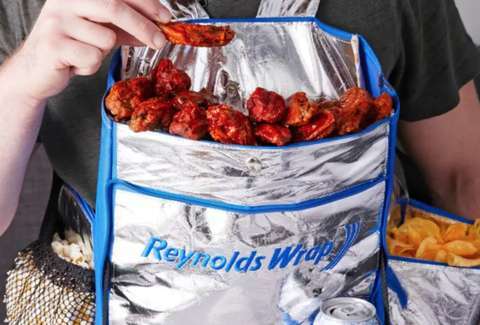 It's from Reynolds Wrap, and we fully endorse its existence. The harness features a main pouch, for wings, or, you know, celery or something. Then there's a side pocket for, like, chips and dip, or veggies and dip -- or you could just fill all of it with different kinds of booze. You're an adult, remember? Speaking of booze, there's also a beer slot. And finally, there's a food tray "that turns you into a human table," according to the website, ReynoldsHungerHarness.com (link SFW). The idea is it'll allow you "to go all four quarters plus the Halftime Show without taking a break." Or, turn you into a barn animal. The best part is that it only costs $4.99. The worst part is that it's already sold out. But maybe you'll be able to find it on eBay.